This guide looks at how you can demonstrate critical thinking, what triggers critical thinking, and how you can reflect on your learning process. 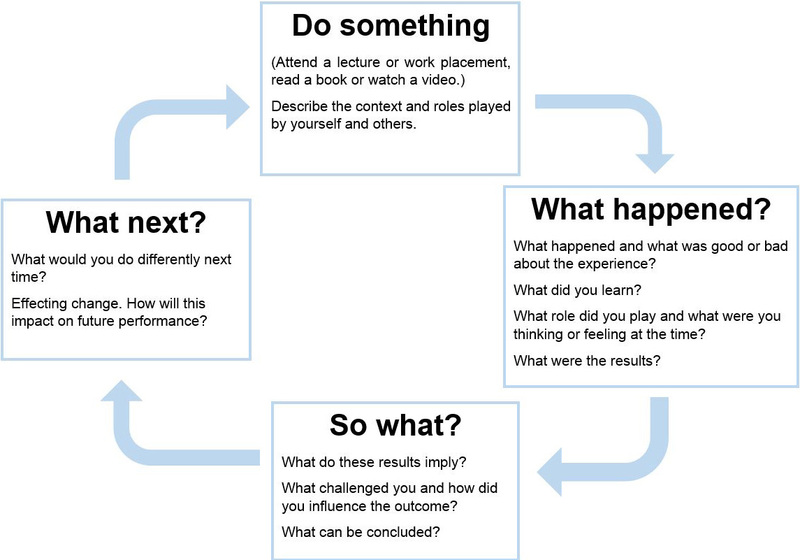 You can use the learning cycle and the six questions (5W + 1H system) to trigger your critical thinking. Think about the six questions: What, Who, When, Where, Why, and How, as demonstrated in the table below. What are the main messages, arguments, results, or findings? What type of source is it? e.g. a research study, professional opinion, discussion, website or other? Who has written, said or produced the source? Is the author/speaker an organisation or an individual? Are they an expert in the topic? Could they have any bias? Check if recent work is available; older key information may still be valid. Where did you find the information? Where was it published? Did you find the information by chance? Or did you find it through a systematic search? Why has this been written, said or produced? Who is the information aimed at – professionals or patient/client groups? How has the author/speaker come to their conclusions? Is their line of reasoning logical and understandable? If it is research or a review of research, how was it carried out, was it done well and do the conclusions reflect the findings? Six questions (5W+1H) to trigger your critical thinking (adapted from Aveyard et al., 2015). 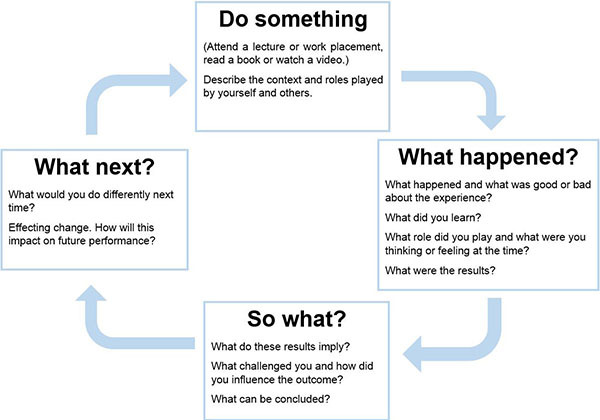 This is the learning cycle that can help you reflect on your learning process. In this cycle there are four stages, as summarised in the diagram below. Learning cycle (adapted from Batista, 2007). Summary of a learning cycle which can be used to bring about critical thinking. Don't forget - the Library also runs bitesize workshops on critical thinking. To find out more and book a place click here . Aveyard, H., Sharp, P. and Wooliams, M. (2015) A beginner's guide to critical thinking and writing in health and social care, 2nd ed. Maidenhead: Open University Press, p. 19. Available from: http://lib.myilibrary.com/Open.aspx?id=332096 [Accessed 14 July 2016]. Batista, E. (2007) Executive coaching change management. Available from: http://www.edbatista.com/2007/10/experiential.html [Accessed 14 July 2016]. Plagrave (n.d.) Critical thinking skills IN: Skills4StudyCampus. London: Palgrave Macmillan Higher Education. Available from: http://www.skills4studycampus.com/palgrave/ [Accessed 18 July 2016]. (Used in table 1 next to ‘What’). (Used in table 1 next to ‘Who’. Icon revised by Gil Dekel). (Used in table 1 next to ‘When’). (Used in table 1 next to ‘Where’). (Used in table 1 next to ‘Why’). (Used in table 1 next to ‘How’). Head image by Max Griboedov/Shutterstock (image ID:332573291). Critical thinking by Plymouth University [PDF]. Critical appraisal of a journal article by University College London [PDF]. Problem solving and analytical skills by Kent University. Reflective learning by Reading University. Critical thinking at University: an introduction - a FutureLearn MOOC - run monthly and created by the University of Leeds. Critical thinking: an introduction - this workshop session was run by the University of Southampton Library and recorded via Panopto. This session looks at what critical thinking is, why you need to do it and how to go about it. This session will introduce you to the main concepts and suggest resources to help you improve your skills. There are opportunities to pause the recording and practice what you have learnt via some short activities within the session.